Cedar Specialist is located in Chesterfield, MO and offers deck maintenance, deck staining, residential powerwashing services and cedar restoration for damaged cedar structures. For over 15 years we have provided exceptional deck staining services to the West County St. Louis area including Ballwin, Chesterfield, Manchester, Ellisville and the entire St. Louis metro area. 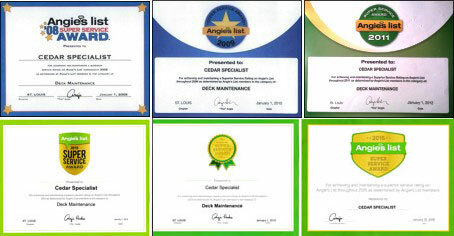 We have received many awards, included Angie's List Superior Service Award several years in a row. We specialize in powerwashing and staining old and new cedar. We also provide expert pressure cleaning for Vinyl, Colorlock and Masonite Siding. We use biodegradable cleaners to protect your plants and vegetation around your home or business.